One of the most common complaints of patients presenting to a facial plastic surgeon’s office are those regarding the nose. When the nose is distracting it produces disharmony with the face, and one’s view is automatically guided away from other pleasing facial features. For example, someone with “beautiful eyes” will always have a nose that is in proportion with the rest of the face. When choosing a rhinoplasty surgeon it is important to find someone who understands both the cosmetic and functional aspect of nasal anatomy. It is also important for the doctor and patient to have a way to properly discuss individual ideals of nasal beauty. Not only is the nose a cosmetic aspect of one’s appearance, it also serves an important functional role. Indeed, we are designed to breath through our noses. When forced to breath through the mouth it makes one feel restricted, look sick and seem unhealthy. A well-proportioned nose will not only fit the face but will also work the way it is meant to. A sound and thorough understanding of a nose’s functionality on both the inside and outside is vital whenever considering surgical alteration. When discussing a procedure that will alter the shape of a persons nose, it is often difficult to convey the effect. Furthermore, the surgeon’s view of the ideal nose on a person’s face may be different from the patient’s view. While aesthetic ideals of nasal proportion have been described, how the nose will harmonize with the rest of the face must be individualized. For example, generally a woman’s nasal bridge should be flat to slightly concave. Most would say that a convex nasal bridge on a woman is masculinizing. However, this rule can not be universally applied. Artistic creation of a nose that is in complete harmony with the rest of the face and fits the patient’s view of beauty is the goal. Preoperative patient and surgeon communication is imperative. Use of computer imaging to fully convey these thoughts are very important. Please refer to the 3D imaging section for further discussion of computer imaging. 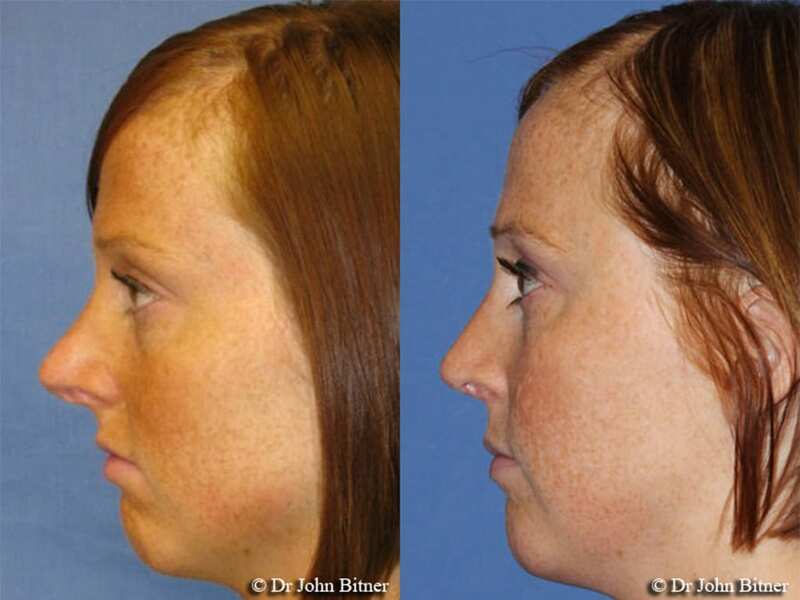 During Dr. Bitner’s residency and fellowship training, he learned rhinoplasty techniques from many of the world’s experts. While there are a great many minor variations, grafts, suturing techniques and cartilage cutting to each surgery, there are two general approaches he uses. 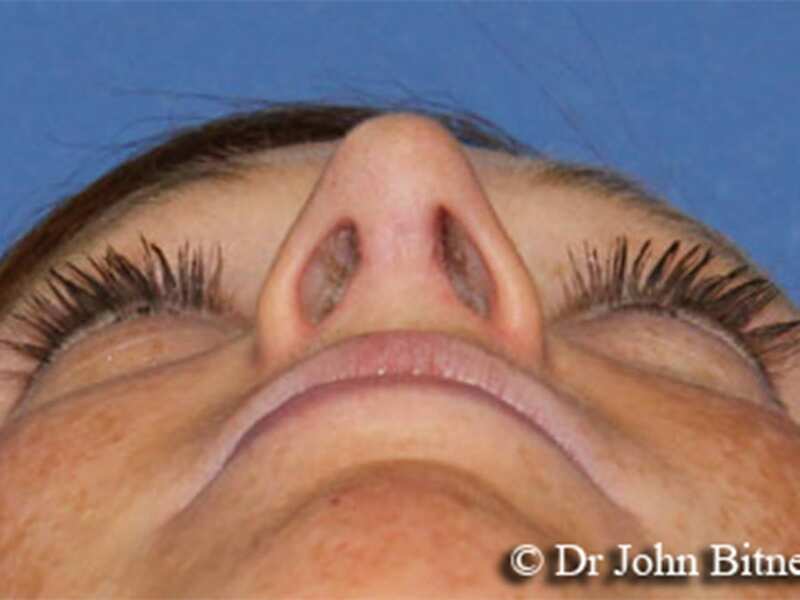 About 80% of the rhinoplasties he performs are through incisions made only inside the nose. This avoids any external scarring and speeds the recovery process. This type of approach is called a closed or endonasal rhinoplasty. Occasionally, the tissues are not able to be elevated off the stucture of the nose or visualization is inadequate and an open approach must be taken. 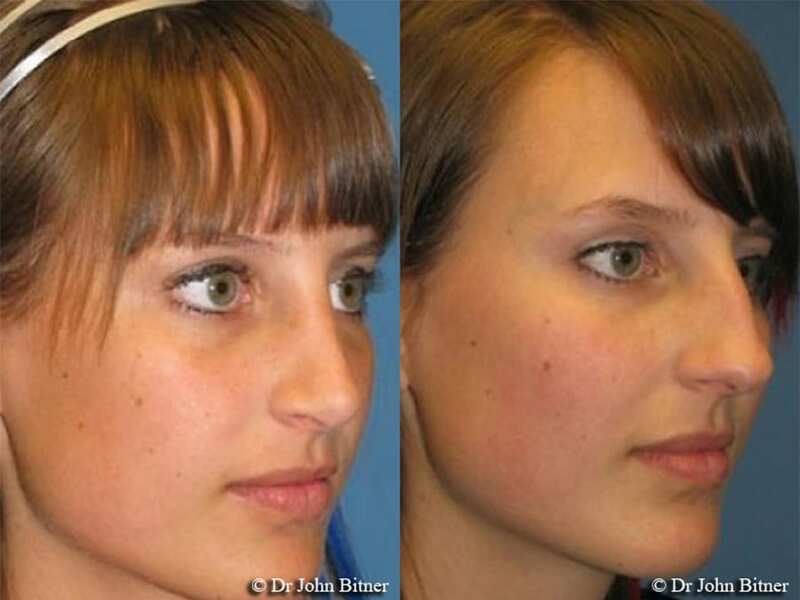 This approach is called either an open, open structure or external rhinoplasty. The main difference between a closed and open rhinoplasty is an incision at the base of the nose. Although the incision is visible during the initial portion of the healing process, the final scar is barely noticeable. Decisions about whether to use an open or closed approach is one specific to each case and is decided by the surgeon. 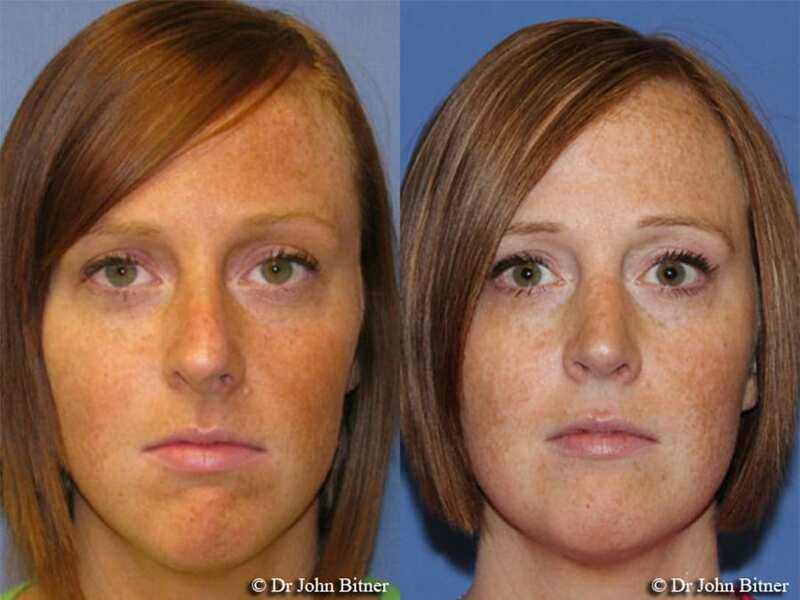 Most patients need to account for approximately one week to recover from a rhinoplasty. Although not particularly painful the most common complaint it that it’s just hard to breathe though the nose as you recover. While Dr. Bitner does not place any packing inside the nose during or after surgery, there is usually scabbing, crusting and swelling of the tissues that blocks one’s airway. Bruising around the eyes is common especially when any bony work has been done and the bones were fractured. The bruising has generally started to fade during the first week, but can take two or more weeks to completely resolve. At the time of nose surgery, paper-thin splints are placed inside the nose along the septum and tape and a cast is placed on the outside. The stitches on the inside are all dissolvable. The patient is asked to return at one week and everything is removed. The nose will still usually appear swollen and bigger than what the patient wants, but will not look strange or obviously bizarre. However, the final cosmetic result may take many weeks or even months to achieve as the swelling resolves and the healing process completes. Once the splints are removed and the cast is taken off, the breathing improves but the person may continue to feel stuffy for several weeks. 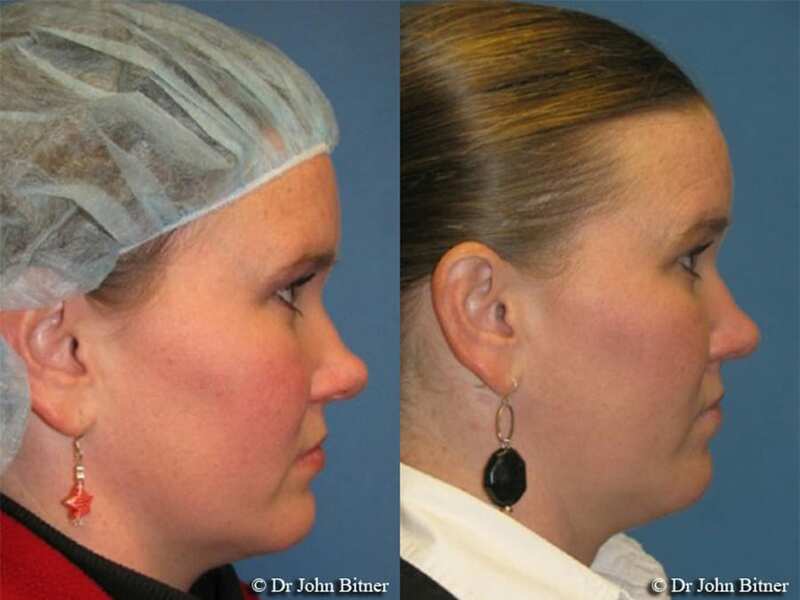 As a general rule, a rhinoplasty is a safe operation and can be done in Dr. Bitner’s office based operating suite or in the surgery center on an outpatient or day surgery basis. Most patients do very well after surgery, heal completely and are very pleased with the final cosmetic and functional result. However, in surgery many variables exist and nothing can be guaranteed. Some of the risks that have been described are: worsening of nasal obstruction, abnormal scarring on both the inside and outside of the nose, bleeding, infection, unacceptable cosmetic appearance, perforated nasal septum, exposure of grafts or implants, memory loss and even death. During your initial consultation, Dr. Bitner will review some of these risks and provide reasonable expectations. During your preoperative visit just before surgery Dr. Bitner’s staff will review and ask you to sign a surgical consent form. This form will review the risks of the surgery. Please take the time to fully review the consent form and feel free to ask any questions as they arise.